On Friday night, I passed by dear ol' Watsons and was surprised to see the 500ml Bioderma Créaline H2O going for $39.90, instead of the usual (and slightly ridiculous) price of $59.90. I'm probably gonna buy more of this when I head to Taiwan in June (WHOOP WHOOP!) but $39.90 is pretty reasonable already. 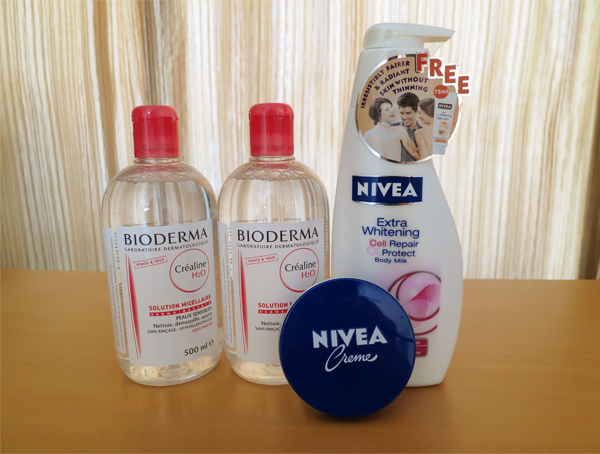 I picked up 2 Nivea products as well, the Extra Whitening Cell Repair Body Milk (Freebies are all out of stock. Bummer!) and the original Creme. I'm really liking this brand quite a bit, so I can't wait to see how these 2 work out for me. Anyway, right before this little haul, I had actually picked up a moisturizer at VMV Hypoallergenics. And I still have like a bunch of unopened moisturizers at home... Why, hello new obsession! LOOKBOOK: I'm a pinafore girl. RAMBLINGS: Oh, Tory! And life in random. LOOKBOOK: The sailor and her book.